Focus on each sound individually. Hear the pitches, the rhythms. Hear melodies where you thought there were none. See patterns where you thought there was only randomness. Now imagine you’re someone for whom sound is everything. That you don’t have to be reminded to stop and listen. That instead you cannot stop hearing the world around you. And then imagine you have gone completely deaf. It is late in your life—a life that has been a challenging one—and you yourself are a difficult person, given to rages and melancholy. You are now trapped completely within your own mind. All that aural sensitivity is turned inward. Imagine your interior soundscape and how that is in harmony and dissonance with your life experience. And now imagine the music you would write. That is Beethoven’s Hammerklavier Sonata. It is a difficult piece to listen to. But listen. If you give yourself over to it, you will hear a lifetime within it. You will sense all of Beethoven’s brilliance within it. The Hammerklavier Sonata is Beethoven’s love song to sound, with all the passion, joy and pain that entails. The Hammerklavier is Beethoven’s Life Song. Nadia, that expresses my wonderment at Beethoven’s music. I attended the Houston Symphony playing the 9th symphony yesterday. One of the best performances I’ve ever heard. Yet it never leaves one’s mind that he was stone deaf when he wrote and conducted it. Maybe there is hope! I’m so glad this resonated with you, Don. I wasn’t sure when I published it if anyone would be interested. I wish I could have heard the 9th with you. It, too, is transcendent. A poignant, yet thrilling threnody! It was a little thrilling to write. And thanks for the new word. It’s a beauty. Elegy, Dirge, Requiem, Threnody: different tints for the Threads connecting us with our Life Beyond. Beethoven has a special place for yours. Of course this must be a must: Hammerklavier Sonata. Thank you Scholar, Curator, Muse, and Creative Spirit. 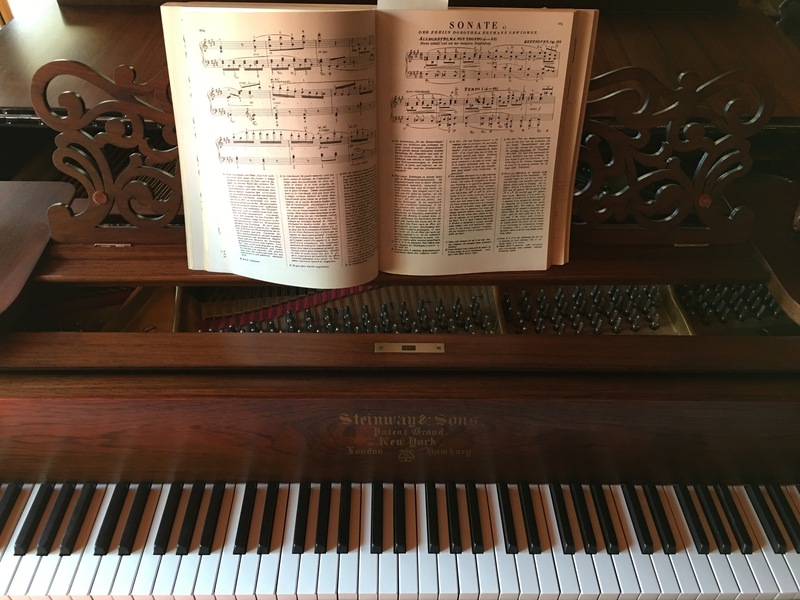 This is so interesting Nadia….not being familiar with this piece I watched Valentina Lisitsa play it on utube, watching her hands move as she played and I wondered if Beethoven somewhat navigated with this sense. You have proposed so many speculative ideas in your post here, which I thank you for. I hardly know where to begin! To have any of our senses diminished has always fascinated me. Wonderful post, Nadia. I’m so glad you watched this on YouTube, Jana. It’s interesting, I had a conversation recently about whether the fingers of a pianist have “ears”. It was after watching the TV ad for the Samsung smartphone where a pianist is playing two pianos, one on which all the strings sound the same tone. I believe the fingers do start to “hear” in a sense.